Whispers in the Loggia: Beseeching a "Welcome"
A decade in the making, the most significant change to the English Mass in some forty years is close at hand. Its confirmation by Rome expected as soon as April, with implementation most-often tipped for Advent 2011, the third edition of the Missale Romanum has garnered no shortage of attention in church circles over the years, with a heated divide spurred between supporters celebrating the new rendering's uptick in "sacral language" and enhanced fidelity to the Missal's original Latin, and critics contending that the rebooted text would signal a departure from the conciliar premium of the people's "full active participation" in worship. The first vernacular text to be identical for English-speaking Catholics worldwide -- and one that sparked a tempest on its premature implementation in South Africa -- the Missal overhaul arguably remains unknown to the bulk of the people in the pews, so a catechetical effort planned by several of the 11 Anglophone conferences is soon to be launched. Yet in the meanwhile, taking to the same pages where the rector of Seattle's cathedral made waves in December by sounding a call for a delay (and garnering support from over 17,000 signatories), the Stateside church's chief liturgist, Bishop Arthur Serratelli of Paterson, has penned an extensive essay for America with an eye to "welcoming" the new texts and explaining how they came to be. Tempting as it is to snip, the fulltext of Serratelli's piece is especially worth reading for all sides... so, well, have at it. 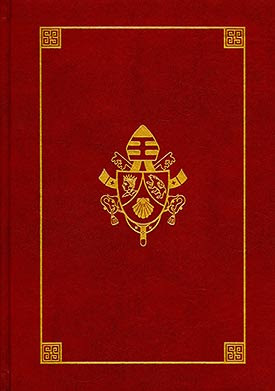 While the OM1 recognitio was granted in order for catechetical efforts to proceed and sufficient musical settings to be prepared for the text's arrival, it's bears noting that, as of this writing, the Missal's other eleven sections remain in edits, their final form only to emerge once confirmed by the Holy See.